Good Morning Traders! Mr. Toad’s wild ride….trading started with an increase in volume, the small caps led on a rally to new all time highs, but big cap blue chips had a crack in the ice. Once again, the Nazdaq and Russell made afternoon highs while the Sps and Dow failed to follow suit. A flight to “safety”? unfolded as market participants dogpiled into cash, tens, 30 years, bunds….march Bunds made new contract highs along with the cows and of course, Russell. Liquidation flushes in currencies and metals, liquidation flushes in Sugar and coffee which then found good support and reversed, continued downside vacuum in nat gas, heavy end of day selling in copper,,,something for everyone as nervous markets sitting on top of big February trend moves approach month end. 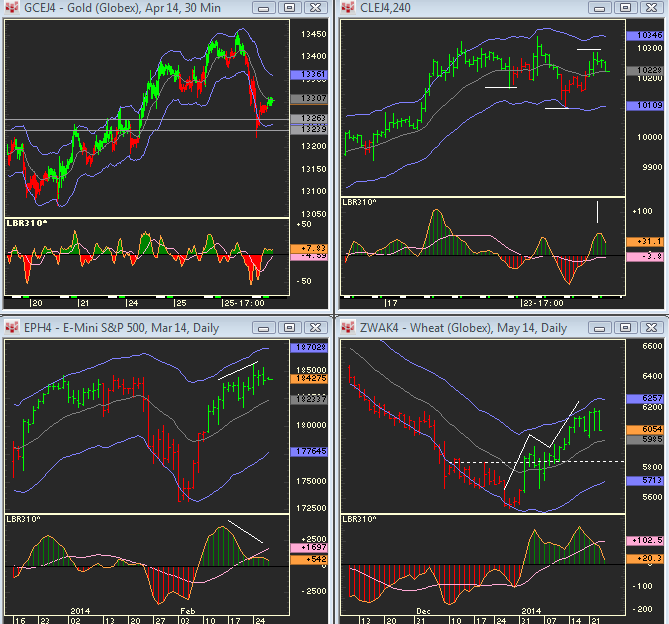 There are 10 day SELL DIVERGENCES on the SPs Naz and Dow. The Russell has still been in a sustained uptrend with 13 closes on one side of the 5 SMA, though. It would need a lower high on the intraday charts to set up a flush below the daily 5 SMA. We have seen the SPs remain mired in choppy trading ranges many times in the past – i.e., last week in December into the third week in January. This could be a similar scenario unfolding. Currently the daily EMA for the SPs comes in around 1824 and on Friday it might be up to 26/27. Wheat has A B C up basis May contract and can push back below the daily EMA. Technically this has been a reaction up in an overall downtrend and a better base needs to be built. Gold and Silver have Pinball Buys. ROLL to May copper and silver. They may or may not make a test of Wednesday’s lows but there is GOOD SUPPORT underneath – see the chart of gold. 2136.5 is a trade back up into the prior range for silver. Crude – Pinball Buy played out nicely with a test above the previous day’s high. However, if this A B C down fails to lead to a new high, look for a first cross sell on the 240 minute charts to lead to another swing down (see chart). AD – 10 day trading range with three bar triangle – poised for a breakout. Dollar index made 240 minute U turn and can trade up higher. 1838.50 and 1841.50 – the two main volume nodes for 10 day look back window in the SPs. 1849 – POC from Wednesday – now resistance.